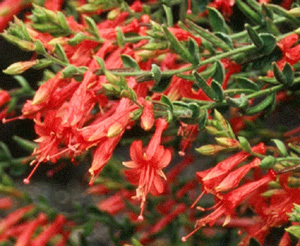 Joy Creek Photo Archive (c) all rights reserved Zauschneria cana ssp. latifolia is a spreading non-woody perennial with finely haired gray-green foliage. It is a cascade of orange tubular flowers for our autumn hummingbirds. July to frost. 6 in. x 2 ft.